The 4-year-old boy seemed to be suspended from a balcony. An adult standing on a nearby balcony seemed powerless to help. Disaster seemed the only possible outcome. Then, to the nimble rescue on the streets of Paris on Saturday evening, came a young man whom some French people have started to call the Spider-Man of the 18th, referring to the arrondissement of Paris where the episode unfolded. With a combination of grit, agility and muscle, the man hauled himself hand over hand from one balcony to another, springing from one parapet to grasp the next one up. A crowd that had gathered before he began his daring exploit urged him ever upward, according to onlookers’ video that was shared widely on social media. 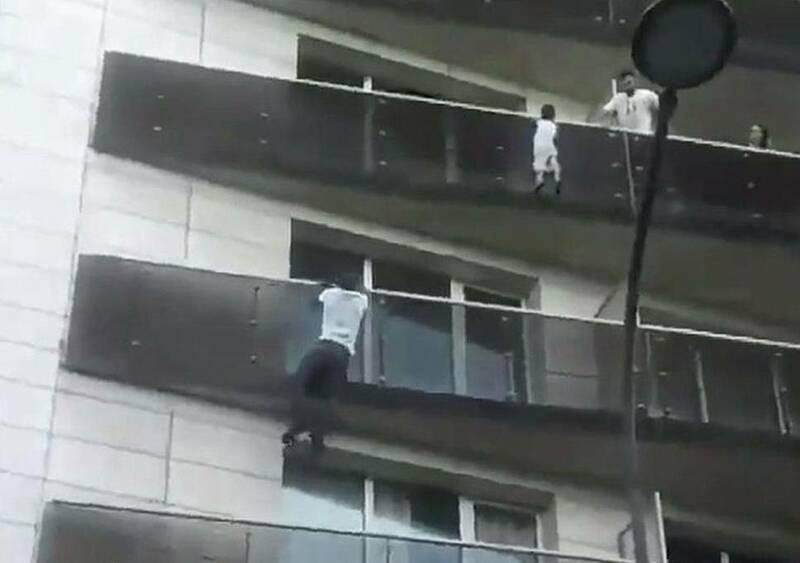 Finally, after scaling four balconies, the man reached the child and pulled him to safety. And suddenly, an act of individual courage and resourcefulness began to play into Europe’s fraught and polarized debate about outsiders, immigrants and refugees. The man, identified as Mamoudou Gassama, 22, is a migrant from Mali, a troubled former French colony in northwest Africa, who journeyed through Burkina Faso, Niger and Libya before making the dangerous Mediterranean Sea crossing to Italy and arriving in France in September, without documentation. On Monday, after his heroic rescue of the boy, he met with President Emmanuel Macron. Now, he will get the requisite documentation to live legally in France. “I told him that in recognition of his heroic act he would have his papers in order as quickly as possible,” Mr. Macron said in a statement on Facebook after meeting with Mr. Gassama at the Élysée Palace in Paris. Mr. Gassama will be one of a lucky few in a country with increasingly tight immigration rules and a generally skeptical attitude toward migrants who are seeking primarily economic benefits. In 2017, only five people were granted residency papers for “exceptional talent” or “services rendered to the community,” according to statistics from the French Interior Ministry. In 2016, there were six. On Monday, sitting across from Mr. Macron in one of the palace’s many gilded rooms, Mr. Gassama, wearing jeans and a short-sleeved shirt, told the French president about the rescue. “Bravo,” Mr. Macron said, as the two men sat before TV cameras. Still, the French president, who defeated the anti-immigration far-right leader Marine Le Pen in the presidential election last year, was quick to clarify that Mr. Gassama was an exception, not the rule. A sprawling migrant camp near the northern city of Calais was razed in 2016, but hundreds of Afghans, Eritreans and Ethiopians continue to gather there in hopes of reaching Britain. In Paris, makeshift encampments of migrants under bridges and in parks are regularly evacuated by the police, only to grow again. Mr. Macron himself has taken a tough approach to immigrants. Parliament has been discussing a draft law put forward by the French government that restricts the rights of asylum seekers, a measure that has drawn fierce criticism from human rights groups. Mr. Macron has said repeatedly that France could welcome only those with legitimate grounds for asylum, a point he reiterated in his meeting with Mr. Gassama, according to Agence France-Presse. “An exceptional act does not make a policy,” Mr. Macron later told journalists at the Élysée, the news agency reported. Some, including groups that help undocumented migrants, criticized the government as hypocritical for praising Mr. Gassama while pushing to deport others like him, calling Mr. Macron’s Élysée invitation a public relations stunt. This was not the first time in recent years that France celebrated an immigrant’s heroism. In January 2015, 24-year-old Lassana Bathily was widely praised for hiding customers in a cold-storage room after a gunman attacked a kosher supermarket near the Porte de Vincennes, in eastern Paris. As France struggled to cope with the terrorist attacks at the supermarket and at the offices of the satirical news weekly Charlie Hebdo, his actions provided much needed solace. Mr. Bathily, a Muslim from Mali, was granted French citizenship later that month, and he currently works at Paris City Hall. Even Ms. Le Pen’s National Front party offered to support Mr. Gassama’s bid for residency — but only in return for the expulsion of all the other migrants living in France without official consent. The boy saved by Mr. Gassama was alone in the apartment while his father went grocery shopping, said François Molins, the Paris prosecutor. The boy’s mother was not in Paris at the time. Mr. Molins told the BFM television news channel that the father had taken a long time to return home because he had decided to play the smartphone game Pokémon Go as he was leaving the store. “He is devastated because he realizes what he did, and the tragic consequences that it could have led to,” Mr. Molins said. The father was taken into police custody on Sunday, and an investigation has been opened for “failure to meet parental obligations.” A conviction on that charge carries a sentence of up to two years in prison. The parents have not been identified, as is customary in French criminal inquiries. The father has been released pending trial. As for Mr. Gassama, he told the newspaper Le Parisien that he was with his girlfriend and wanted to go watch the Champions League soccer final Saturday evening when he came across a commotion around 8 p.m.